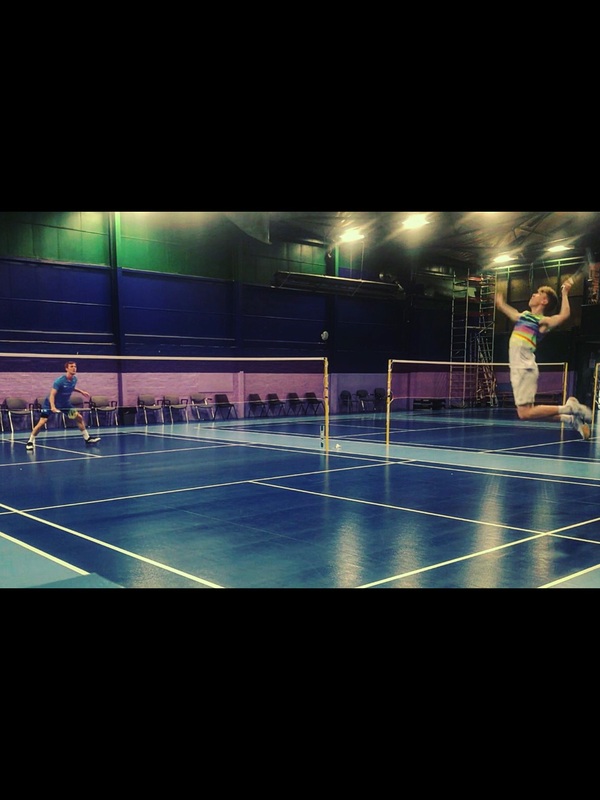 Jordan’s passion for badminton drives him through a rigorous programme of training in a bid to perfect his technique and increase his chances of both national and international success. 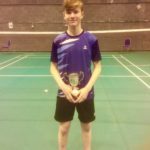 He recently won the title of Scottish Student Sport (SSS) Colleges Scottish Champion 2018 as well as runner up in the Glasgow District Churches Badminton Association (GDCBA) Annual Championships. 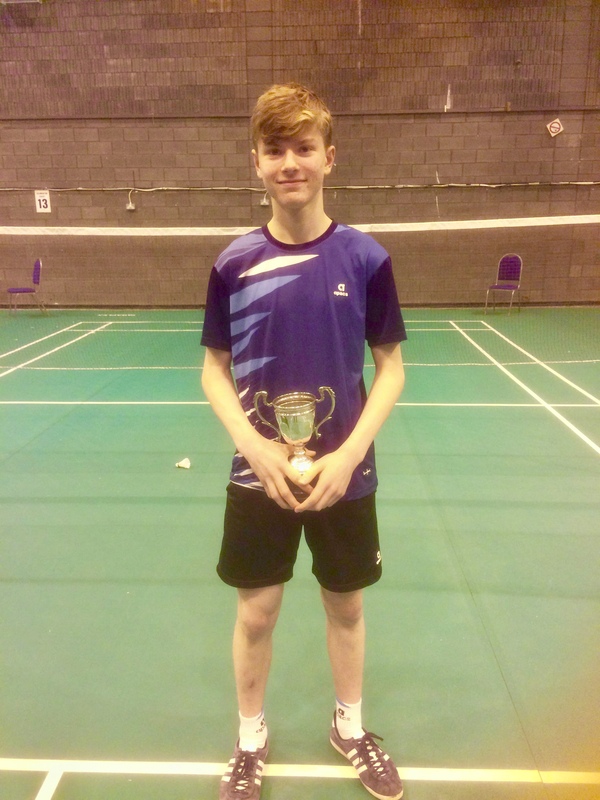 In 2017 Jordan also represented Scotland in Slovakian, Polish and Welsh Badminton Internationals which helped him to jump more than 400 places in the world rankings. Jordan impressed us not only with his talent and drive but by his work ethic and desire to inspire others through his coaching. 11-year-old Libby from Liverpool is a multi award winning world champion. 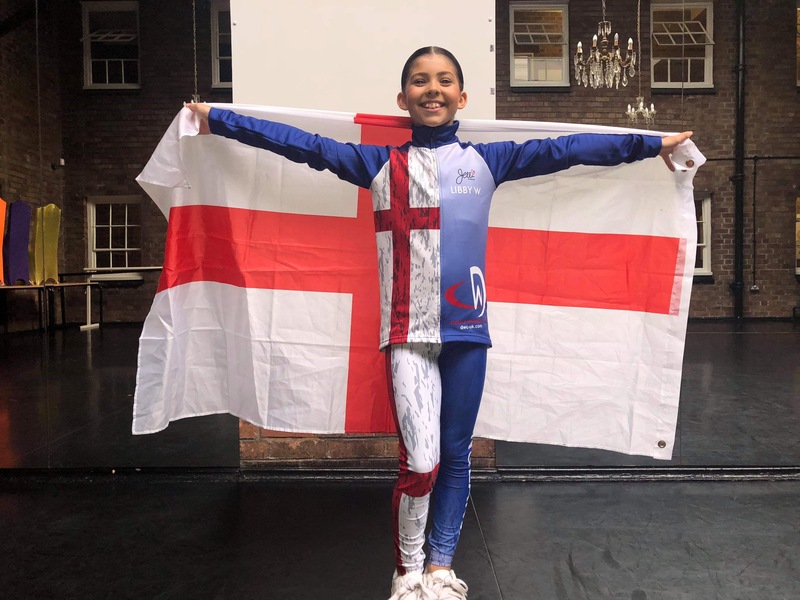 Last year, among Libby’s long list of accolades were England mascot at the 2018 Dance World Cup, and seven world champion titles in lyrical, jazz, hip hop and contemporary dance categories – as well as bronze, silver and gold medals. Libby impressed us also with her fundraising efforts to give back to charities close to her heart like Alder Hey Children’s Hospital and Blossom’s Legacy. We love to see applicants willing to take time out to use their talent to inspire or make a difference to others. 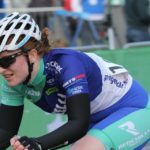 Georgia from Moray holds an array of cycling titles but her long term goal is to become a professional cyclist and compete in the Olympic and Commonwealth Games. She holds the Scottish Junior Time trial records at 10 miles, 25 miles and 50 miles. 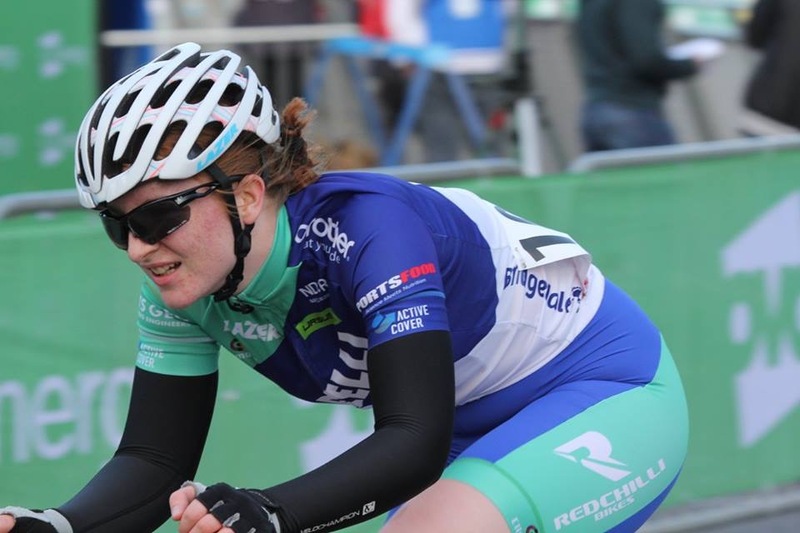 In 2017 she was Scottish Junior Road Race Champion and in 2018 the Senior Scottish National Madison Champion. 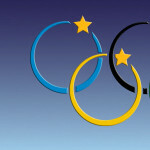 Making the move to elite level in any sport beyond regional or national achievements demands the athlete compete in international events to gain the profile and recognition needed to succeed. Georgia impressed us not only with her talent, grit and determination in the face of adversity but also with her willingness to embrace and give thanks to those who have helped her on her journey to success. We’re delighted to join her village and play a small part in helping her raise costs to showcase her talent in an upcoming race. 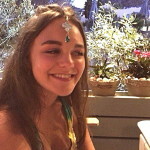 Georgia-Mae is a classically trained ballerina who is now perfecting her talent at Kate Simmons Dance. In her first year she shone earning the role of Clara in her dance school production of the Nutcracker – a role usually only offered to 2nd and 3rd years. Beyond Georgia-Mae’s list of ballet achievements we were impressed by her frequent volunteering efforts including teaching movement and music at a nursery and toddler group. In the future, she hopes to create an outreach dance programme visiting local schools and church youth groups and hopes to create a scholarship for a dance summer camp. We love this drive and ambition that would see her use her love of dance and her talent to inspire and teach a new generation of dancers who might not otherwise have these opportunities. 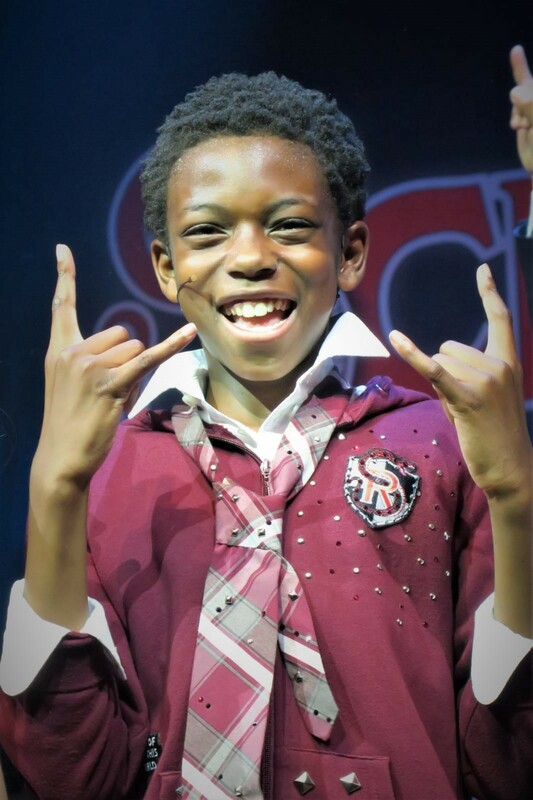 Jeremiah has shown he has a natural affinity and passion for performing, having secured a variety of West End roles in productions such as School of Rock (pictured here) and The Lion King. Jeremiah and his parents are immensely hard working and dedicated in support of his acting dreams, and we are excited to be contributing a part of his fees for his full-time education at Sylvia Young this year so that he can keep on shining! 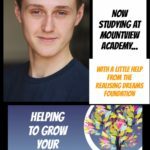 In September 2018, Cameron Rhodes became the first person in his family to study at degree level after accepting a place at Mountview Academy BA(Hons) course in Musical Theatre with a little help from us! 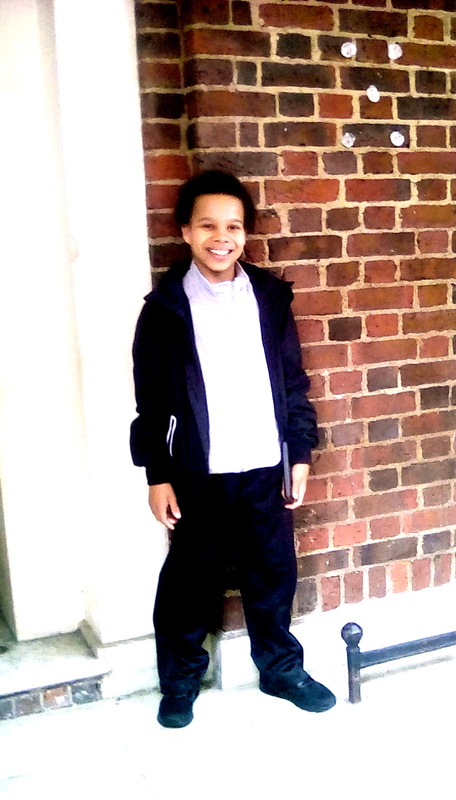 Cameron has worked his way up through training with his family making regular sacrifices and taking out loans to support his ambitions.He had approached countless other government, arts and charities for support without luck as they often don’t support individuals unlike The Realising Dreams Foundation. 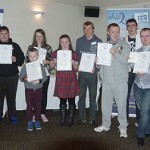 Cameron then won a part-scholarship at Emil Dale Academy, topped up with loans taken by his family. Throughout his journey, Cameron has been active in giving back to others. He regularly teaches acting classes and often helps at his former drama school. 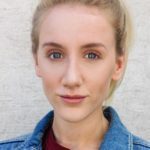 In August 2018 our foundation helped Jenna, 21, from Liverpool take up a place a three-week intensive course at the National Youth Theatre, with the support of the Realising Dreams Foundation. 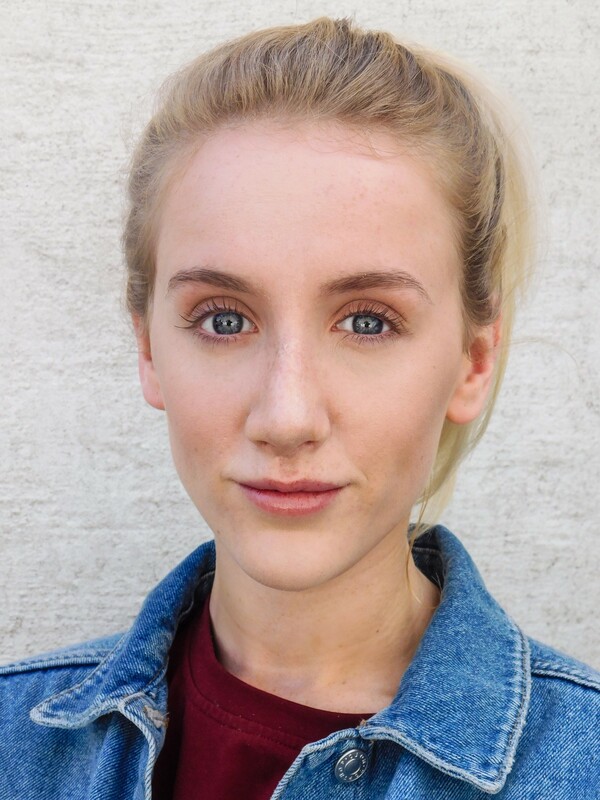 Jenna has already demonstrated a strong dedication to her craft, having completed a 2-year acting and musical theatre course at Rare Studios. She played Sarah in ‘The Salon’ alongside Philip Oliver, Sarah White and Peter Amory, and has had roles in advertising, music videos and independent short films. 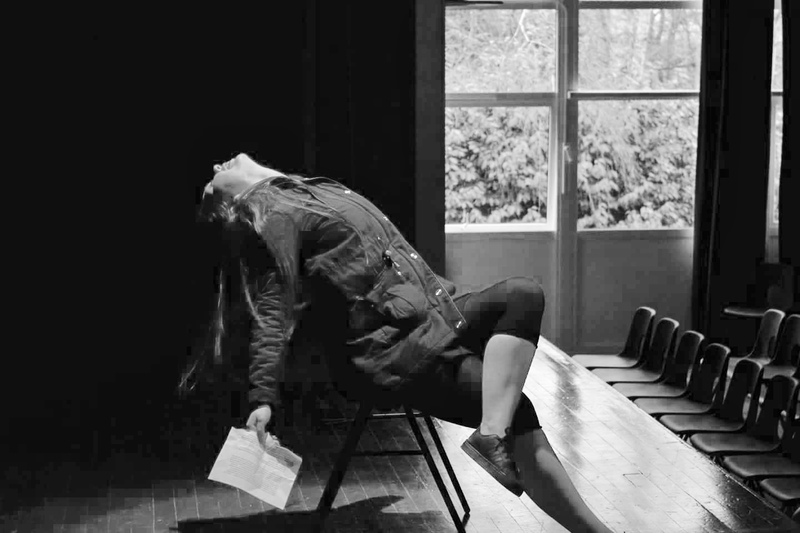 Jenna dreams of one day being a professional actor on TV or with a travelling theatre company, and inspiring others to go after their ambitions. 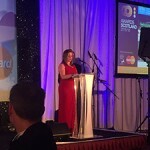 Jenna impressed not only with her talent but her hardworking approach to realising her dreams. She juggles a part time job, fundraising with her classes and acting roles, as well as independent study. Jenna has used all the resources at her disposal to grow and develop her talent, but even after a 50% bursary from NYT the remaining costs were out of reach. 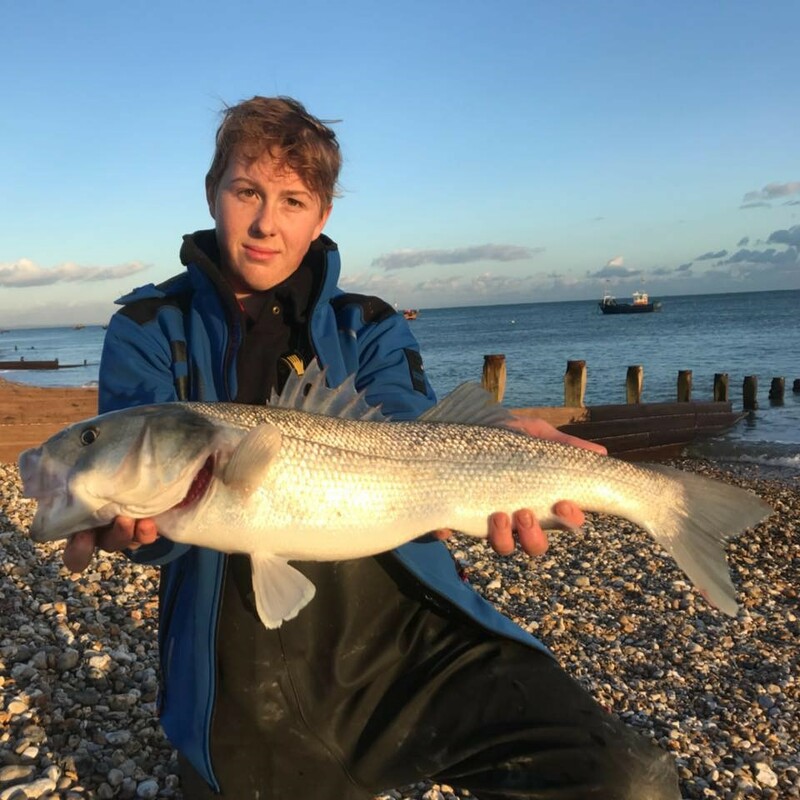 Our first ever angler Dillon achieved a great result at the Home Nations Angling Tournament in June 2018! Dillon and his team won Silver for England, only narrowly missing out on Gold after a tense head-to-head competition. Dillon is a rising young talent in the angling world and we can’t wait to see what the future holds for him. 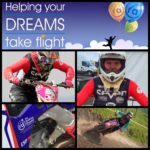 Building on her incredible motorcross successes in 2017, Charlotte is kickstarting her ambitions for this year on a new bike…with a little help from The Realising Dreams Foundation. Click here – to see Charlotte in action. 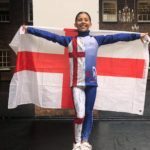 Last year, Charlotte, at only 16 years old, finished 5th in the British women’s (BWMA) and 4th in the acerbic nationals as well as making her making her debut representing Great Britain in the home leg of the IMBAs. 2018 brings new challenges as she competes in 5 rounds of the IMBAs across Europe, 8 rounds of the British Women’s championship and the acerbic nationals once again. Pursuing a career in musical theatre takes more than just talent. 16year old Jessica Kingsley impressed our foundation with her dedication and commitment to using her talent to help others. Jessica refused to accept that her financial difficulties would prevent her achieving her dreams. So when she was offered a place on a two year course at Emil Dale Academy, she began fundraising and working tirelessly to reach her target. Jessica’s application to us in September highlighted her talent, drive and ambitions – not just for herself but also to help others. Ivy secured one of the last performing arts award in 2017 from The Realising Dreams Foundation. 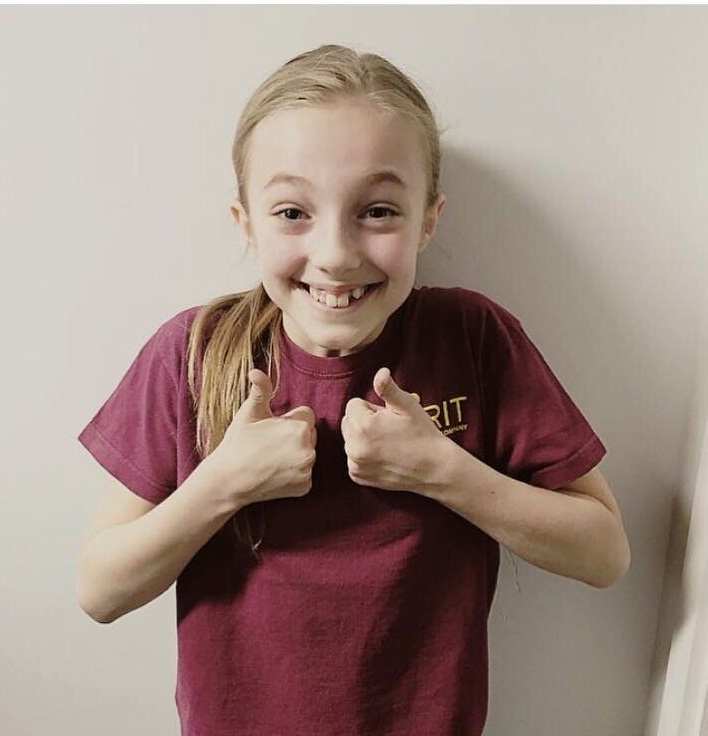 11 yr old Ivy already has several big musical theatre credits to her name, including the role of Brigitta in the Sound of Music UK and Ireland tour, West End stints in Made in Dagenham aged just 8, and most recently a 6 month run in School of Rock. Although Ivy has proved her talent, she has had very little professional training. Then earlier this year she successfully auditioned for a place at The Susi Earnshaw Theatre School but was unable to accept it because of genuine concerns over meeting the ongoing costs – even taking into account the earnings Ivy was able to contribute. 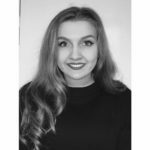 Since taking up her place in September, Ivy has blossomed in confidence and Ivy’s application showed clear talent and several references all confirmed her hard working ethic, professionalism and determination to succeed. She was also praised for her ability to connect with all kinds of people within a theatre company often inspiring younger children to be the best they could. 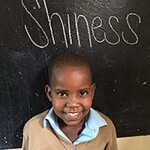 To give Ivy her best chance of success, The Realising Dreams Foundation have stepped in to alleviate some of the financial pressures over the next few terms at Susi Earnshaw. 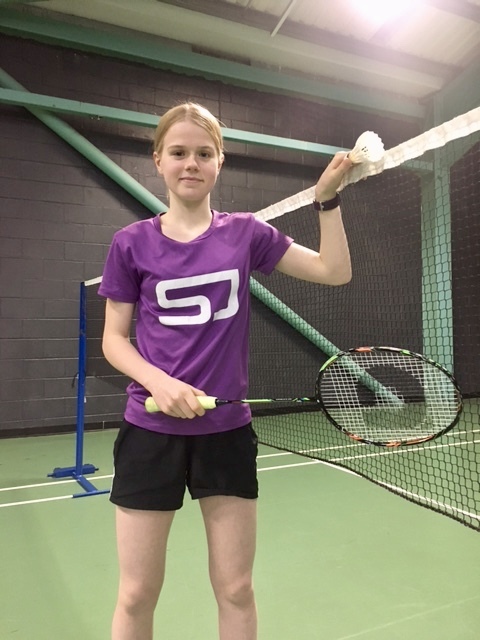 Brother and sister, Danny (16) and Jessica (14) from Lanark are rising stars in the world of badminton and hope to realise their dreams of competing at the Olympics or Commonwealth games. Both of them already represent Scotland in their age categories and Danny also now studies at The Glasgow School of Sport. However, the costs of supporting additional training and competition for two nationalists who have great ambitions has been very difficult. 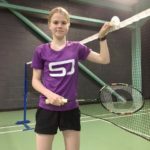 In their younger years they were lucky enough to train with former Scottish international badminton player John Barrie – who provided low cost coaching through their local Lanark YMCA even in his later years. Sadly John sadly passed away this year. 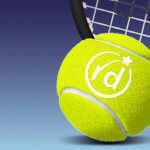 Their current training involves rigorous programme of coaching with national Scottish squad, with badminton coaches David Gilmour and Scotland squad member Craig Goddard in addition to solo performance training. 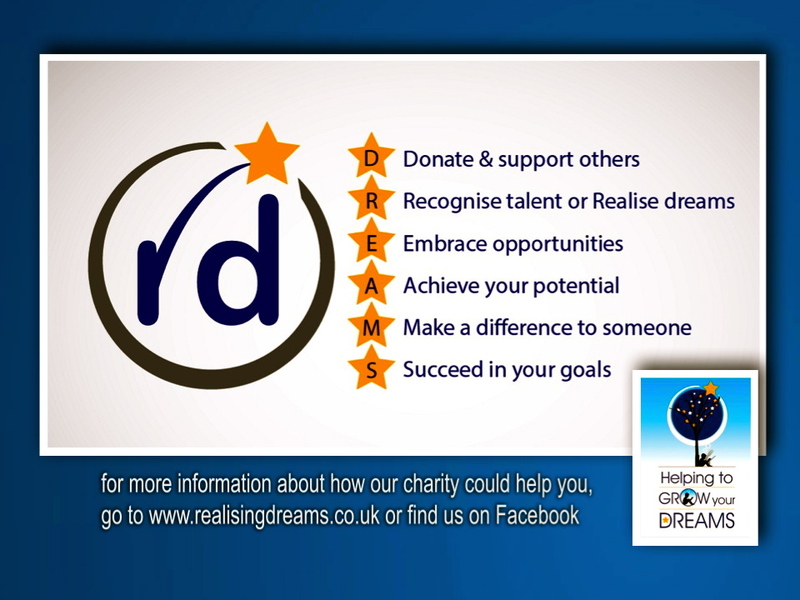 The Realising Dreams Foundation has agreed to award a contribution towards their monthly training costs for the next year. Hear more from Danny as he spoke about his journey at a fundraiser event for us. 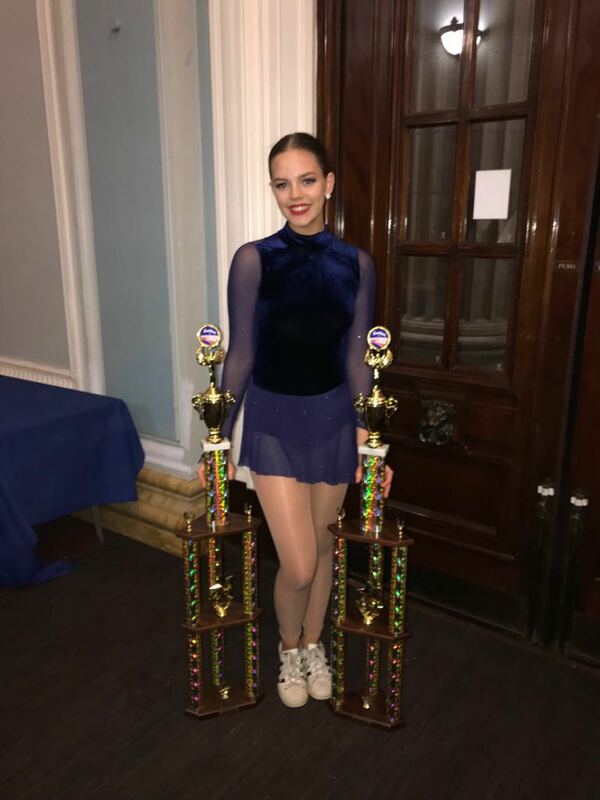 Jodie (15) from Hamilton, Scotland will be taking centre stage with Team Scotland at next year’s prestigious International Cheerleading Union (ICU)Worlds and USA All Star Federation World Championships in Florida. Jodie is part of Rockstar Cheer Dance and Gymnastics group who, following success in national competitions, now get the chance to compete against international teams in the USA. 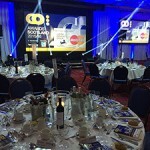 But the costs associated with taking part in this worldwide event were almost out of Jodie’s reach despite an ambitious programme of fundraising being undertaken by her and her fellow TeamScotland squad. We’re helping her with costs and will be following her progress. 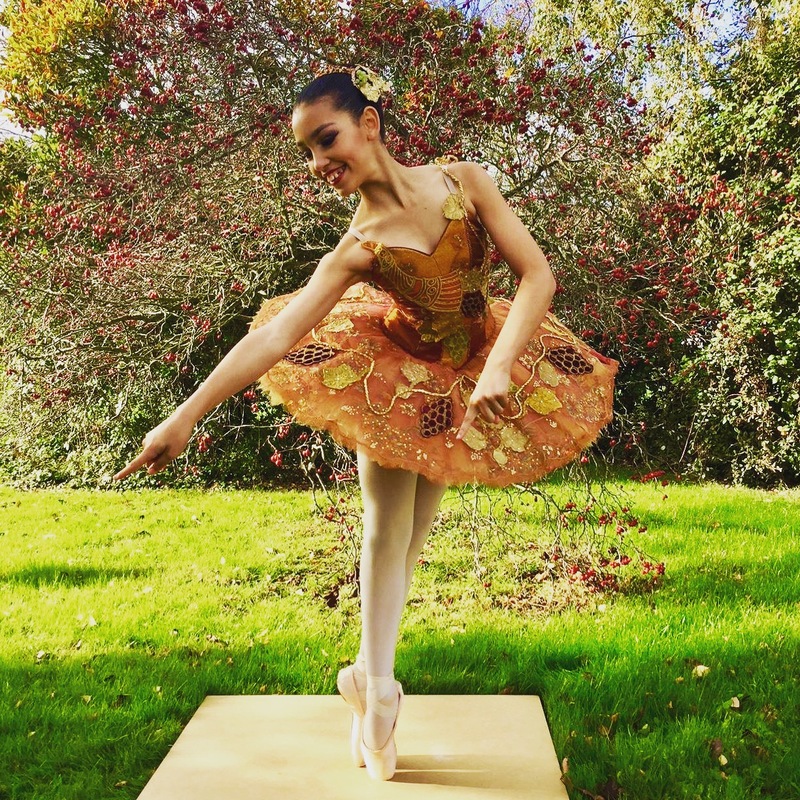 Ballet is a fiercely competitive discipline that few succeed at, yet 11year old Leia’s remarkable talent has won her a place at London’s The Royal Ballet School’s Associates programme and a place at the Bolshoi Ballet’s summer programme in the USA. 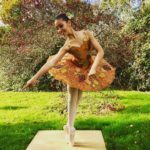 The Realising Dreams Foundation is honoured to support her costs giving Leia the springboard she needs to pursue a professional career in ballet. Leia has a natural talent and passion for ballet that has seen her gain distinction in all her exams. 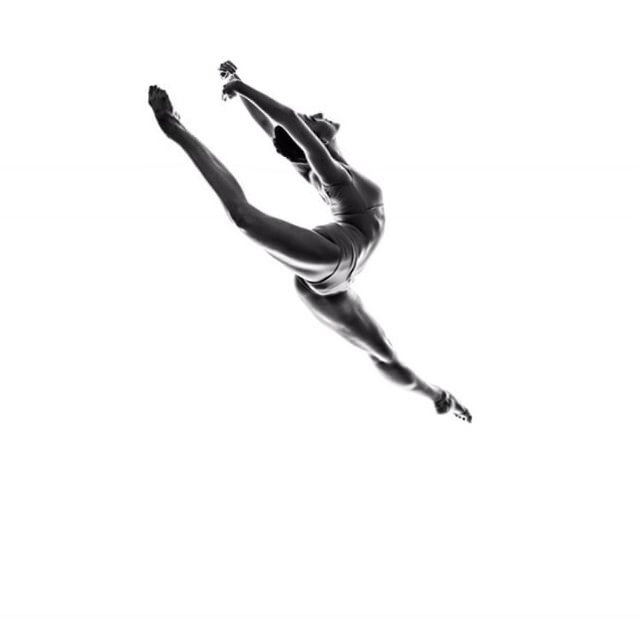 She has also been part of the English Youth Ballet and London Children’s ballet touring company where she performed in special needs school and elderly care homes. Giving back is vital and something we always look for in our candidates. Look at her in action – click here. The Realising Dreams Foundation is giving 15 year old Jake Collins an award to help his climb to the top – quite literally. His love and talent for climbing began when he was young with Jake competing in climbing and bouldering competition since he was just eight. 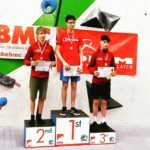 After years of training his talent is flourishing and with a steady stream of impressive climbing accolades he has recently been selected for a place in the British team. 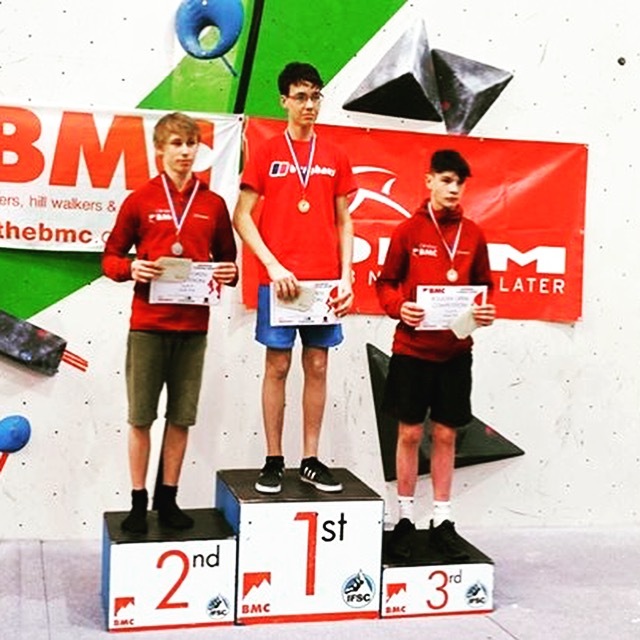 His achievements continue and we are delighted to support his progress as he bids to compete at the Olympics after climbing was officially included as an official Olympic sport. For years, Holly Jones (16) from Pontypool in Wales has dreamed of professional training to build on her natural talent for musical theatre. From this September, her dream becomes a reality with help from The Realising Dreams Foundation as she takes up a place at The Emil Dale Academy. Holly has developed her singing, acting and dancing thanks to school and local theatre. But she has never been fortunate enough to be able to afford professional lessons in any of these disciplines – until now. 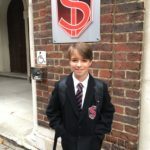 Max Reader (12) from Essex will realise his dream of attending The Sylvia Young Theatre School from this September with a little help from The Realising Dreams Foundation. The charitable foundation has recently awarded funds to other performing arts students – Violet, Lottie and Jack – who are all now building on their talent for musical theatre at specialist schools. Max has been acting since he was eight, and grown into a stage star who has held roles as Eric in Matilda and is currently appearing as Gavroche in Les Miserables in London’s West End. 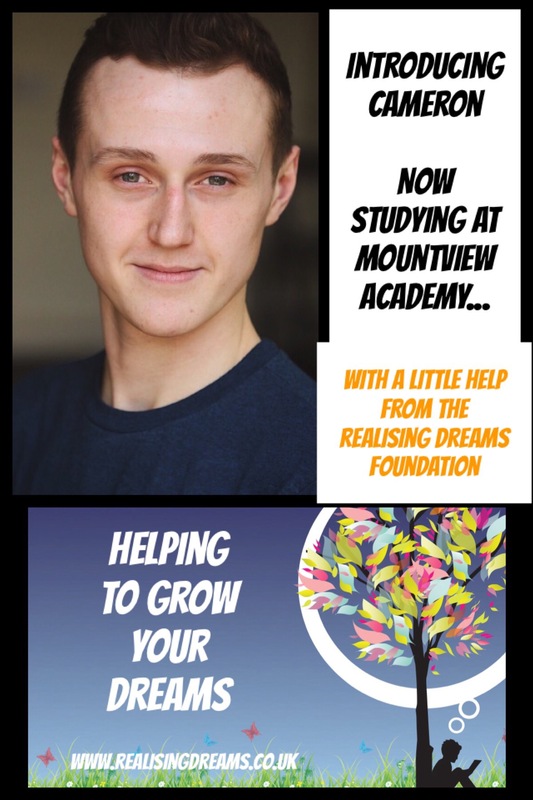 Max’s biggest dream was to study at stage school – something which took a step closer for him this year after he was offered a place at the prestigious Sylvia Young Theatre School. He had been saving his earnings for just this moment. However, even a small scholarship, all his own savings and help from his family, Max found himself unable to meet the total cost needed. That’s when he turned to The Realising Dreams Foundation for help. 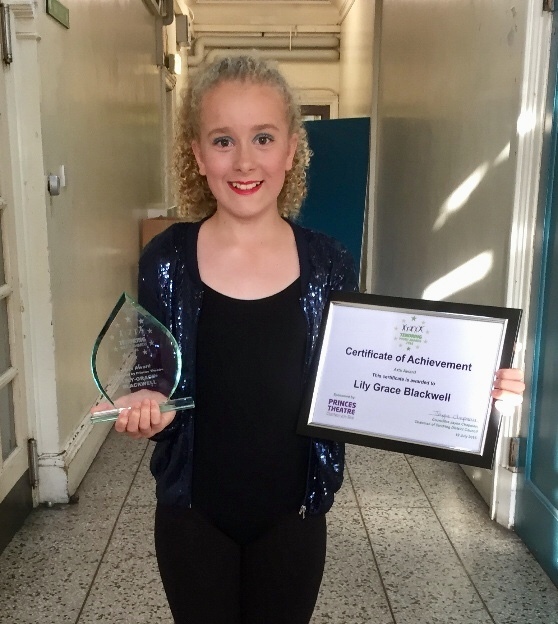 In February 2018, Lily (13) became the final musical theatre student to receive support from The Realising Dreams Foundation until later this year. Our foundation is contributing towards weekly performing arts classes for the next few months in the hope it gives her the edge she needs to secure new roles. Lily who has starred in Matilda The Musical and performed with the National Youth Theatre was struggling to meet the costs of weekly classes necessary to continue her training and complete her LAMDA exams. Her talent and success in Matilda won her a scholarship at Ipswich High School. And while she is an active performing in school shows, she doesn’t receive specialist performing arts training there. 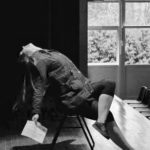 Lily, like many other performing arts students, got a taste for treading the boards and is eager to win new roles in this highly competitive field. In June 2017, Kensey Lycett (19) received an award to help fund a trip to help disadvantaged kids in Kenya. 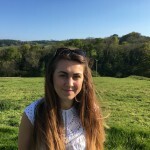 Kensey, from Dorset, has pursued her ambition to be a teacher and has recently completed her first year in primary school teaching at university. 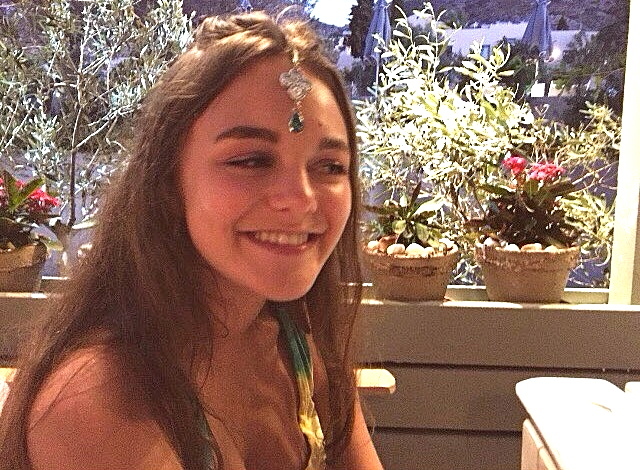 And while she is well on her way to achieving her dream, she was eager to go beyond the UK to gain further experience this summer by teaching disadvantaged young people abroad. 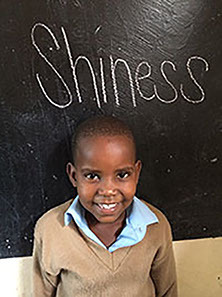 In Summer 2017 she travelled to Kenya working in two schools helping to improve and rebuild run-down facilities as well as teaching the children. 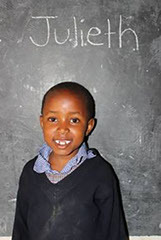 Kensey explained: “We helped with building work on the site for the new school, digging foundations and moving rocks as well as painting all the doors and windows at the school. 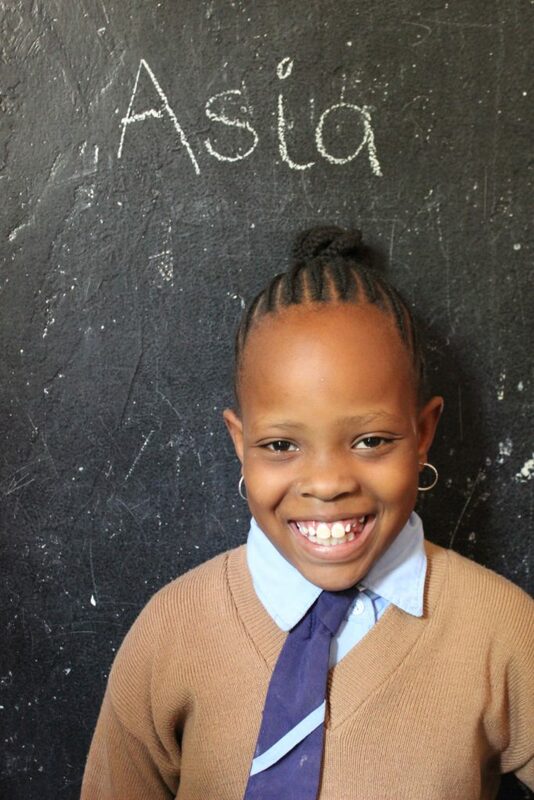 ‘’It was an incredible experience to teach out in Kenya covering a range of different lessons. And as promised I shared my love of dance, by helping to create a dance that the whole school learnt and recorded. We also worked with the children to paint a mural that will be a lasting memory to our trip there. 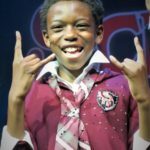 In June 2017, ten year old Jack Courage was awarded help to grow his talent and dreams at a vocational course at the Sylvia Young Theatre School. Jack has been diagnosed with ADHD, Austism and Dyspraxia. A range of professionals agreed that while Jack struggles with academic subjects, he excels in the arts and would benefit from access to practical and performance lessons similar to those offered in performing arts schools. For three years his mum has been fighting to secure an Education, Health and Care Plan (EHCP) to support his needs. The family struggle financially with access to benefits, but no savings to cover performance course costs. Jack’s talent saw him reach the final audition stages for major west end shows and he has been offered places at other stage schools. It was when Jack won a part scholarship to a vocational course at The Sylvia Young Theatre School that his dreams took one huge leap forward. But he tried and failed to secure funding from his local authority. Now following his application to The Realising Dreams Foundation, the remaining costs will be covered. 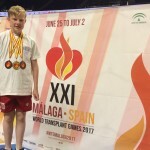 Robert Collins (14) achieved his dream of competing for team GB in the World Transplant Games in Malaga – with a little help from The Realising Dreams Foundation. 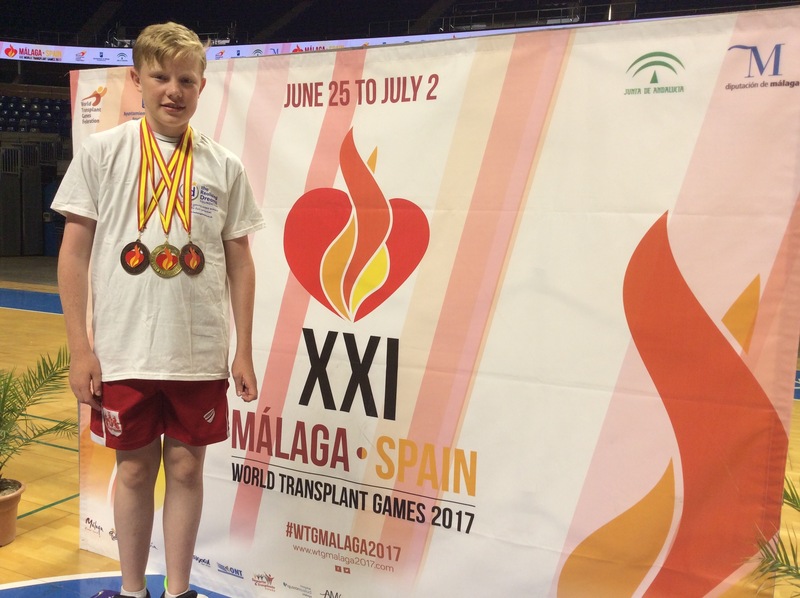 It was an incredible experience where Robert’s sporting ability meant he brought home an impressive three medals – one gold and two bronze! 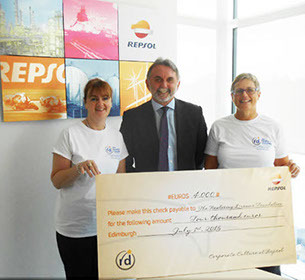 Quite an achievement for Robert who received a kidney transplant in 2009. He represented team GB in badminton singles(gold), badminton doubles (bronze) and table tennis(bronze) and had the honour of carrying his country’s flag! Robert and his family had been fundraising for months to raise the costs needed but were struggling to reach their final target. 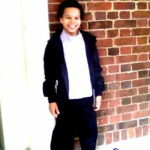 The Realising Dreams Foundation was touched by Robert’s story and his desire to give back. He has received an award of £1,000 to help him realise his dream. Athletes from 60 countries came together at the World Transplant Games in Malage to celebrate life, health and raise awareness of the importance of organ donation. Every athlete looks ordinary, but behind each one is a story of how they received a second chance thanks to organ donation. We are all so proud of what Robert has achieved – he is an inspiration to us all! 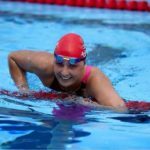 Danielle Joyce is a world record holding swimmer competing for Team GB at this summers’ 23rd Deaflympics in Turkey yet despite her talent she struggled to secure the funding needed for the trip. 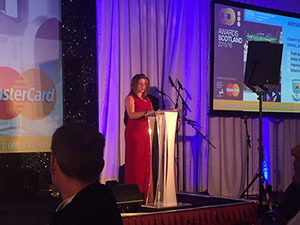 Danielle (20) applied after hearing of our award to Shiona McClafferty. And while the foundation wants to attract a variety of talents, it was impossible to ignore Danielle’s medal and world record winning abilities as well as her voluntary work with disability sport. Despite holding nine current world records, winning gold at the Deaf World Championships in Texas, double gold at the European Championships in Russia and a long list of other awards for her work in sports disability, Danielle was still battling to raise the funding needed to compete. 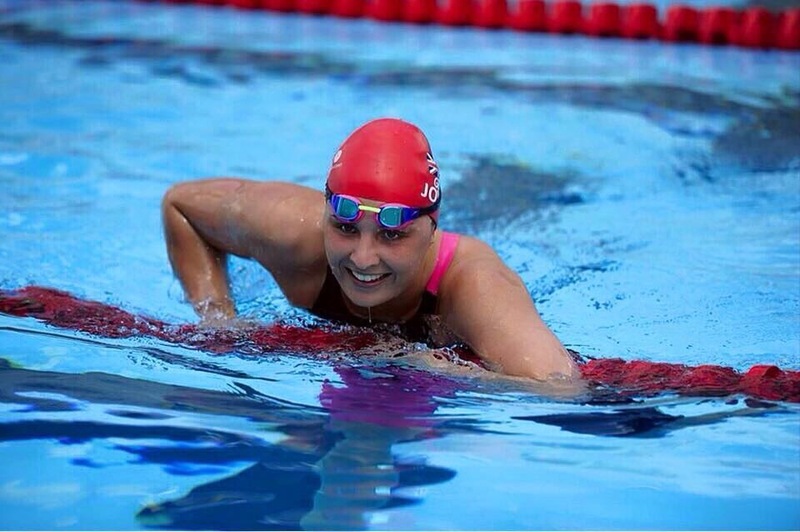 Danielle currently combines her swim training with her BSc in Sports & Excercise at the University of Stirling. Lottie Sicilia (12) was awarded funds in May 2017 to allow her to extend her professional drama, singing and acting classes with Spirit Young Performers Company. 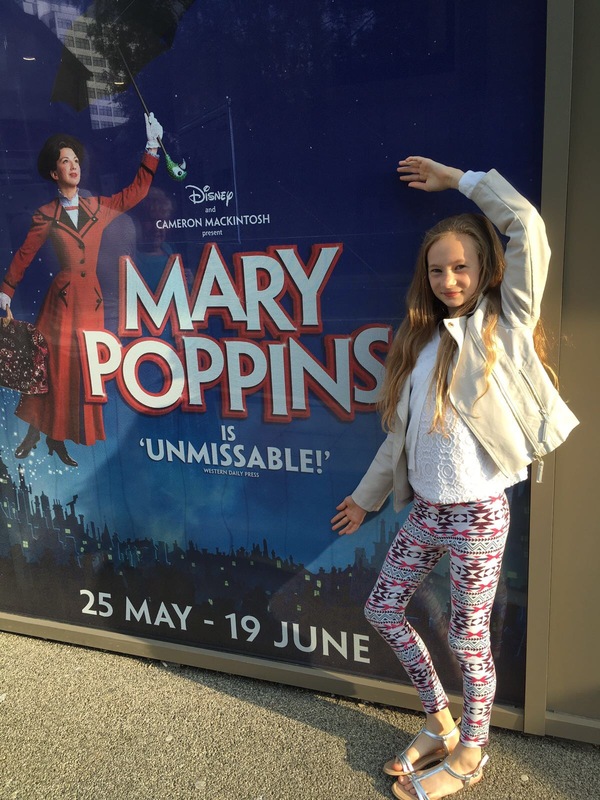 Lottie has held successful roles in Matilda & Mary Poppins, but despite using her own earnings she has struggled to afford more than just 3 hours training per week at Spirit YPC. After seeing her talent, work ethic and glowing references, we agreed to help out to contribute costs so Lottie can take advantage of a full day of classes instead of a half day. This will include masterclasses where she will learn from guest industry professionals. It seems another star is rising. 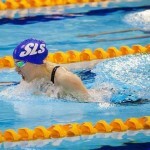 Shiona McClafferty from Lanark is set to make waves at this summer’s Deaflympics in Turkey as she swims for team GB. 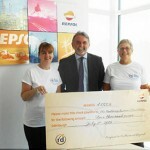 In March 2107, The Realising Dreams Foundation agreed an award of £1,000 to help her get there. 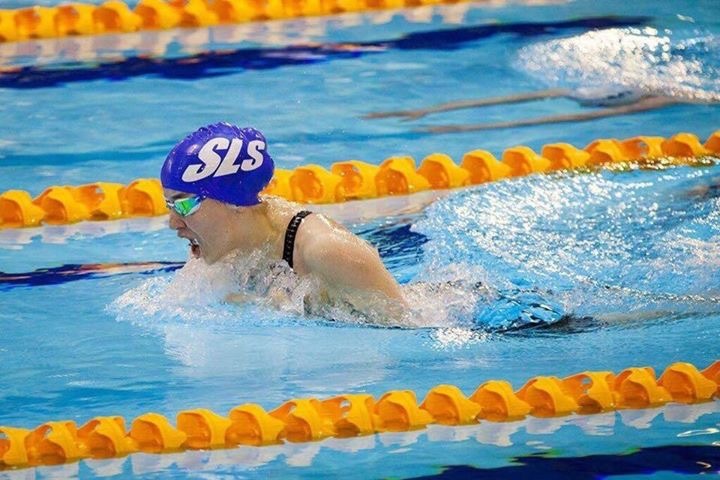 16 year old Shiona applied to the foundation after her swimming talent secured her a prestigious spot in the GB swimming team for the Deaflpmics being held this July in Samsum, Turkey. But the £2,500 cost of the trip was proving a difficult target to reach. 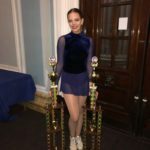 She has never competed in an international competition before so this opportunity is a dream come true – one Shiona has worked very hard for. She has been swimming competitively for eight years. She trains six times a week and attends competitions up to four times a month . After leaving school Shiona has her sights set on becoming a PE teacher. The fact that she is deaf has never stood in the way of her achieving her dreams. Meet 12 year old Violet from London who has become the latest star for The Realising Dreams Foundation in March 2017. Over the next two years, The Realising Dreams Foundation has agreed to provide funds to enable Violet to attend the Arts Educational Schools of London. 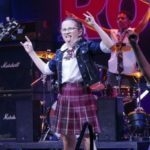 Violet has an extraordinary talent for singing and acting which, with no formal training, won her a lead role in the west end production of Matilda in 2014. 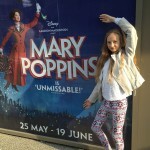 Since then, her ability, hard work and commitment has helped her secure roles in The Sound of Music and Mary Poppins. In each of these roles she has soaked up every ounce of the training she has been given. But what was missing was the right school for Violet to continue her studies as well as develop her passion for acting and singing. After much searching Violet set her heart on attending The Arts Educational Schools of London – a specialist school dedicated not only to an academic education but also to the performing arts. Finding the costs to fund her place proved near impossible. Despite being able to contribute towards the costs, Violet and her mum found themselves desperately looking for a way to guarantee the shortfall. They were unsuccessful with many other charities, trusts and beneficiaries, until they came across our foundation. 15 year old Charlotte Hall from south of England was awarded £2,500 from The Realising Dreams Foundation in February 2017 to cover specialist motocross race training. 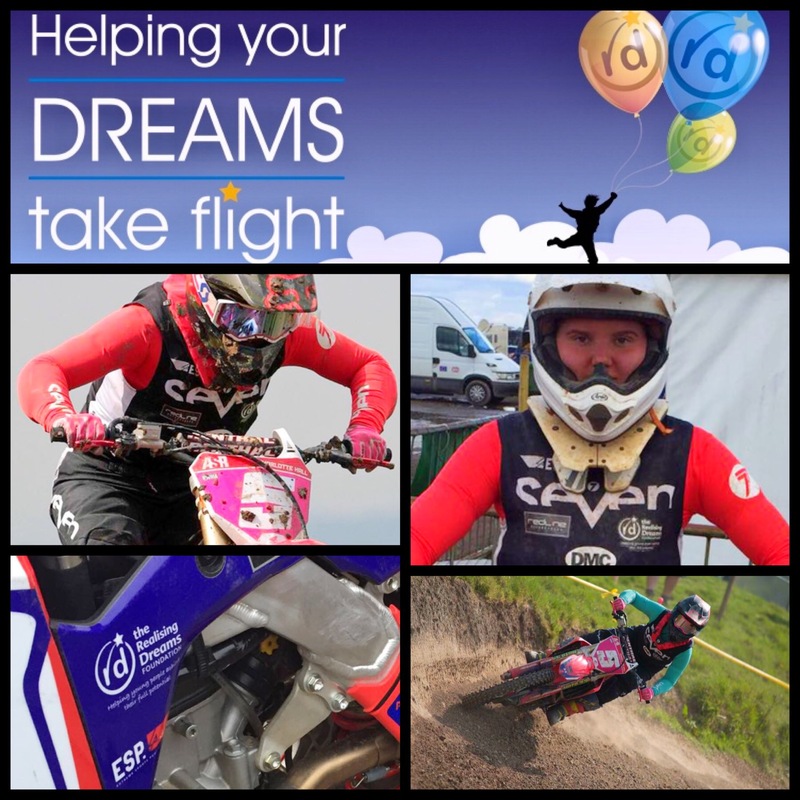 Charlotte’s dream is to compete in European and world motorcross championships. In just 5 years, Charlotte has gone from riding a 65cc motorbike aged just 10 to now riding a 250cc bike and achieving 4th in the 2016 British Girls Nationals. 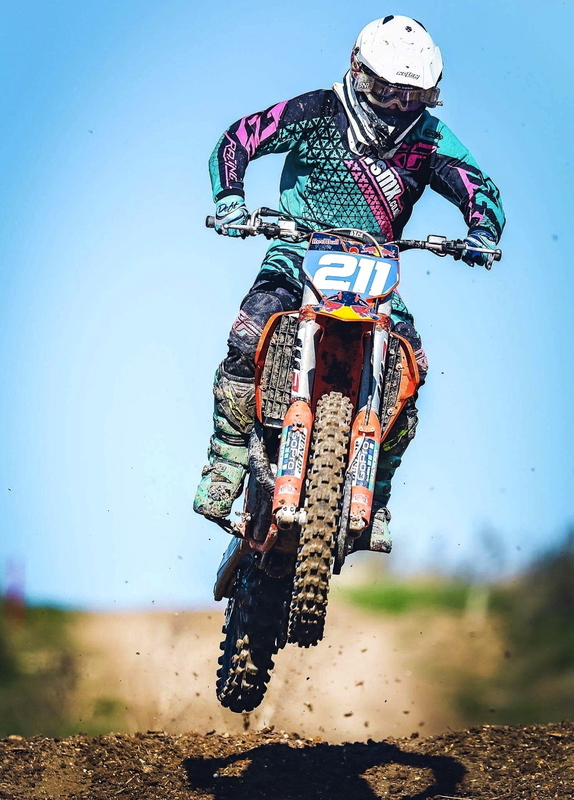 Her extraordinary talent, combined with her determination to succeed has seen her rise through the ranks of the motorcross world very quickly. Now she has a place in a race team and her eye firmly on competing this year in the Acrebis Nationals. There are 8 different rounds held at different locations around the UK with one round in Ireland. 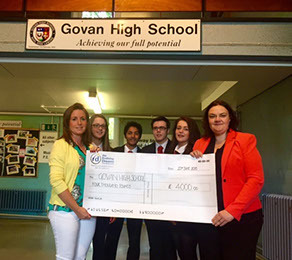 Sophie Anderson is 17 years old with a strong social conscience so when her school, St. Andrews Academy in Paisley, Scotland decided to organise a trip to help build classrooms in Uganda, Sophie was at the front of the line to help. In February 2017, The Realising Dreams Foundation agreed to help her reach her fundraising goal of £2,200 with an award of £700. 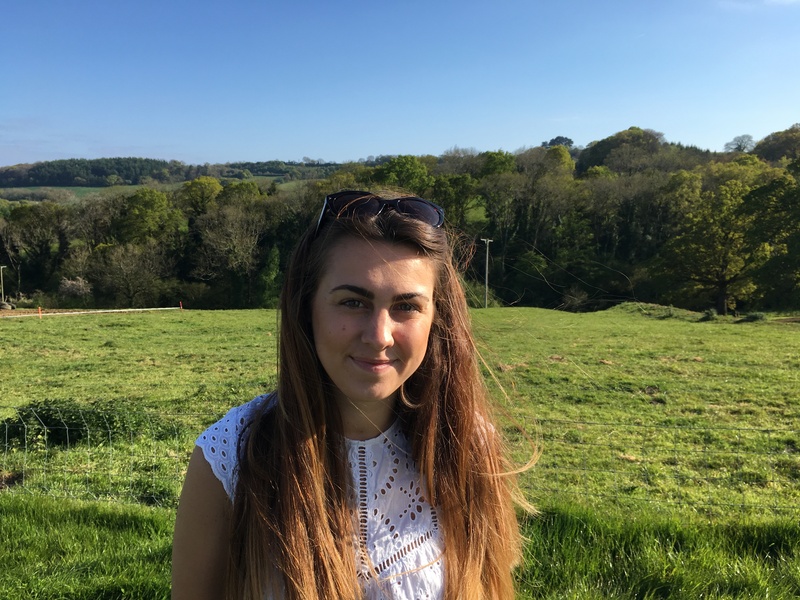 In June, Sophie will travel to Uganda with eighteen other pupils to spend three intensive weeks working with an under privileged Ugandan community. They will live in a local church dorm and work daily to help build classrooms for the school that is currently being built. 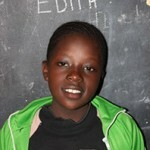 In any spare time, Sophie and her classmates are looking forward to teaching some of the local children some English. 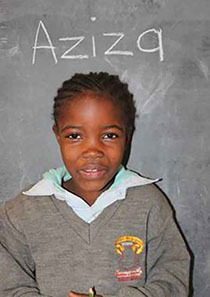 The Realising Dreams Foundation knows that even one person can make a difference. We were impressed by how passionately Sophie feels about helping this Ugandan community. Azeem Amir is an extraordinary 17year old from Rochdale who has dreams of playing for his country. 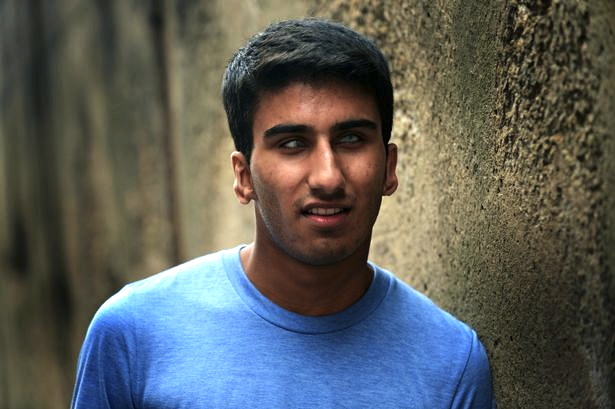 Although Azeem has a visual impairment and is almost completely blind, he has never let his disability get in the way of what he wants to achieve. He has quickly made a name for himself in blind football. He has a contract to play for Merseyside Blind FC and is firmly in the sights of England football scouts. In March 2017 his Merseyside Blind FC earned the title of National Blind Football League Champions 2016/17. Azeem’s talent and determination secured a place at a series of FA residential training events that will take him one step closer to the England Blind development squad. He takes his role as an ambassador for disabled sports very seriously and regularly fund-raises for charities as well as inspiring others to achieve their potential. In November 2016, The Realising Dreams Foundation were delighted to support Azeem’s journey by providing funding through his local football club to cover costly travel expenses so he can keep up his rigorous programme of training. 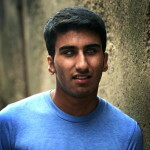 Follow his progress on Azeem’s Facebook page. These two young people who were supported by The Realising Dreams Foundation will have the honour of taking part in The Special Olympics in 2017. 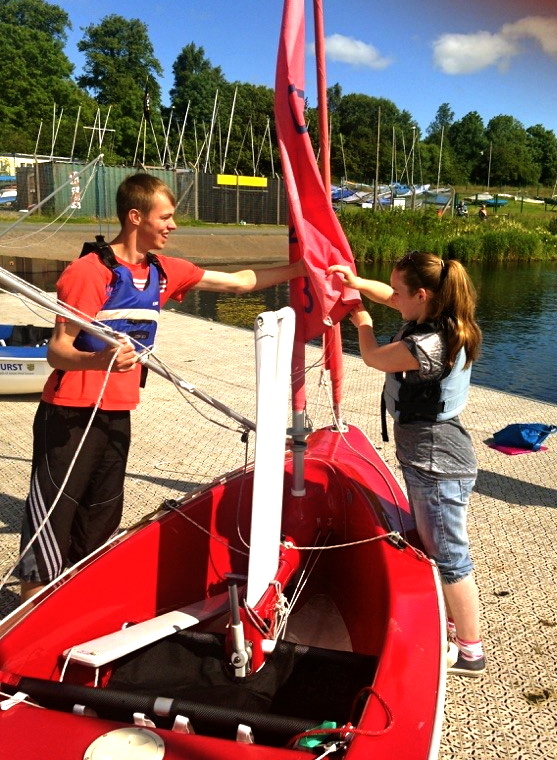 Jamie Kearns (18) and Shannon McGhee (19) both from Glasgow will be competing in the Sailing event in Sheffield in August 2017 representing Scotland West. 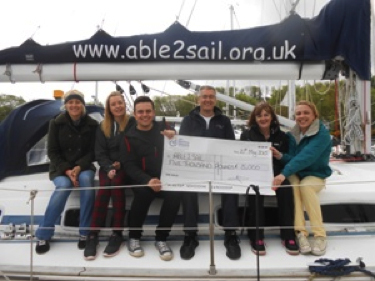 They both received support from The Realising Dreams Foundation in May 2015 to ensure they could continue with their sailing qualifications through the able2sail charity. Now they are looking forward to an incredible experience at The Special Olympics. The Foundation have also helped with the cost of training kit for them as they prepare for event. 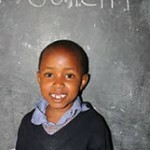 The Realising Dreams Foundation has been supporting educational scholarship places with pupils in Tanzania. As part of our work abroad, we were been inspired by the dedication and determination of staff and pupils at an upcoming school – The Charity English Medium School – who work tirelessly to ensure a better standard of education for pupils at this small school. 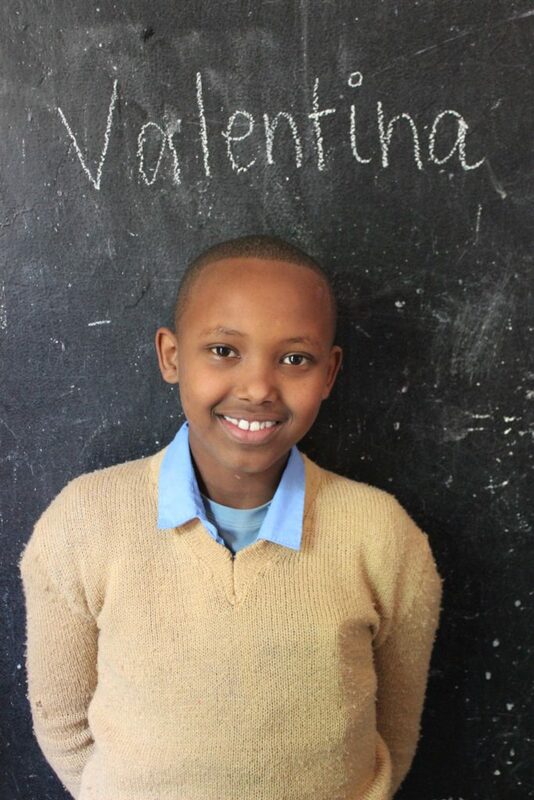 We began our links with the school in December 2015 with the sponsorship of 11 pupils. 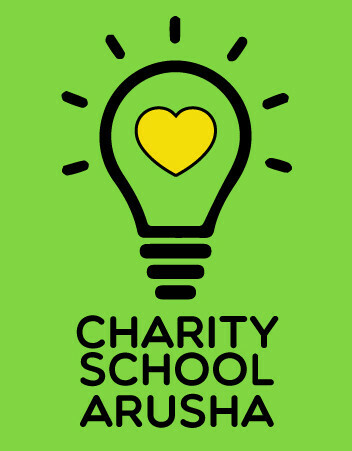 In July 2016, we extended our support to include a further 6 pupils meaning that no pupils in the top three classes of the school are without sponsorship to cover their education. 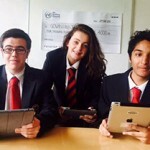 The following photos introduce each of our pupils and give you a small insight into their lives. 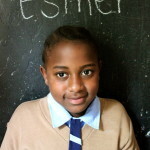 Esther lives in Sekei (5km from school) with her Mother, older brother and sister. Her parents have separated. 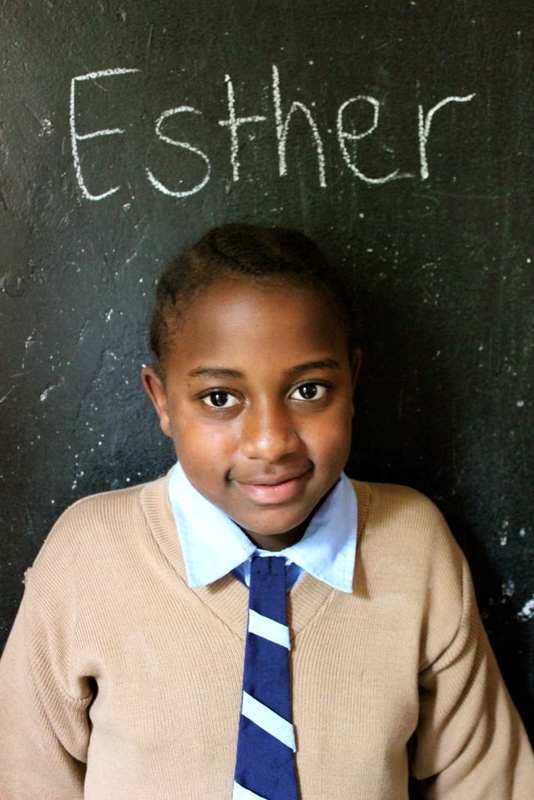 Esther’s Mother works as a house maid and earns 2,000/= ($1.40) per day. 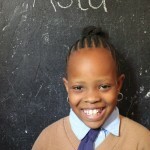 Esther walks the 5km to school every day. 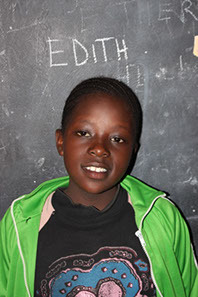 Her older sister attends the School of St Jude’s and her older brother does not attend school. Asia lives in a rented house in Sanawari with her Mother, Father and younger sister Asna (Baby 1 class). Her Father is an alcoholic and currently unemployed and her Mother works as a seamstress. Valentina lives in a rented house in Sanawari with her Mother, Father and younger brother and sister. Valentina’s Father does not have permanent work which puts a large financial burden on the family. 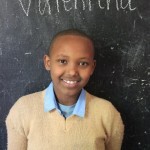 Valentina’s Mother stays at home and her younger siblings both attend Charity School. 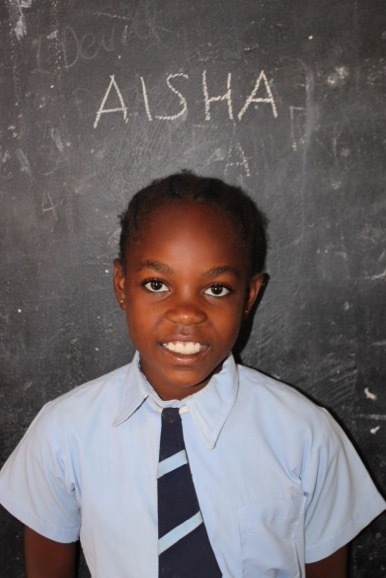 Aisha lives in a rented house in Sanawari with her Mother, Father, younger brother Isiaka (Class 1) and cousin Abdurazack (Class 4). 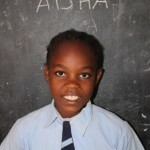 Aisha’s Mother is unemployed and her Father struggles to find casual work locally. 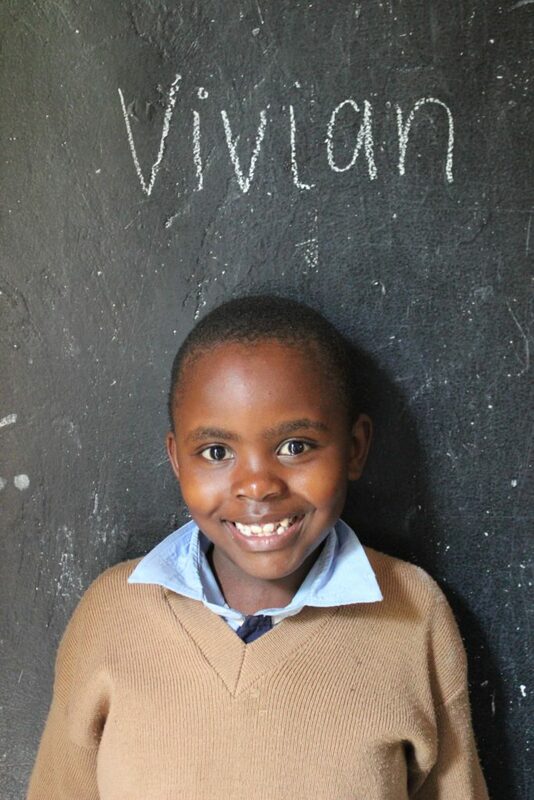 Vivian lives in Sanawari with her Mother, Father, older brother and sister. Her Father works casually in construction and her Mother stays at home. 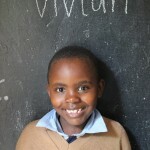 Vivian’s older siblings are both at local Government School’s. Dorice is David’s twin. 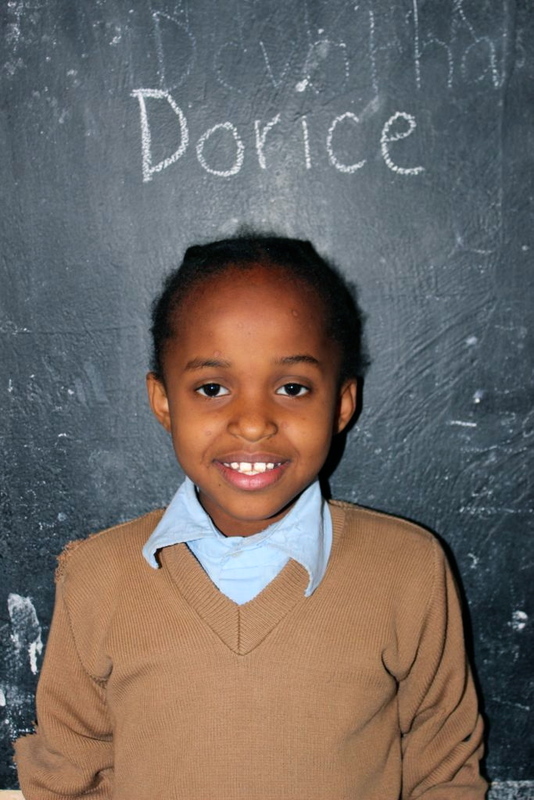 She lives in Sanawari with his Mother, Father, older brother and sister, and her twin brother David. His Father is unemployed and his Mother works as a Nursery teacher at Goodwill School. 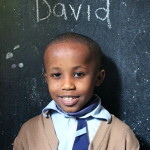 David’s older siblings both attend local Government Schools. 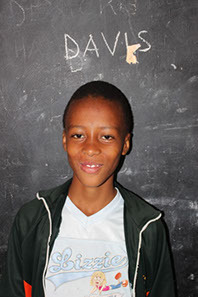 David lives in Sanawari with his Mother, Father, older brother and sister, and his twin sister Dorice. His Father is unemployed and his Mother works as a Nursery teacher at Goodwill School. 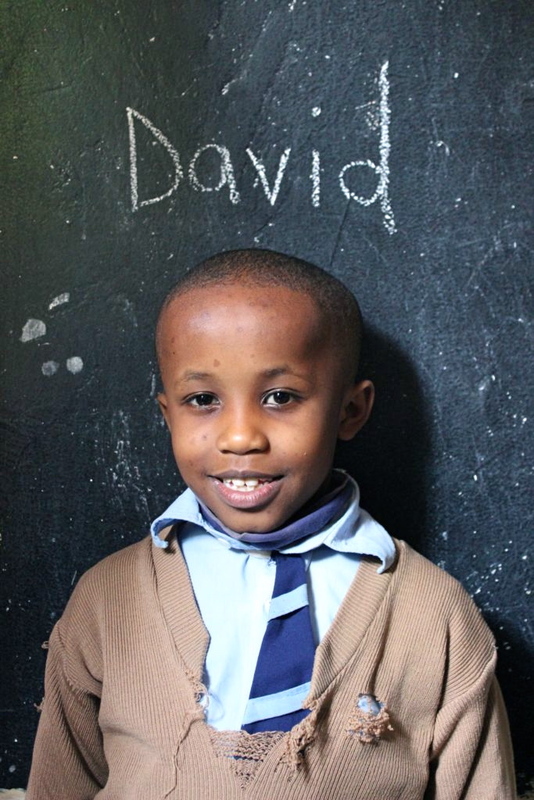 David’s older siblings both attend local Government Schools. 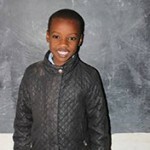 Fanuel is 8 years old, he lives in Sanawari with his Mother and younger brother. His Father has remarried. His Mother works cleaning the side of the roads which is the only income for the family of 3. 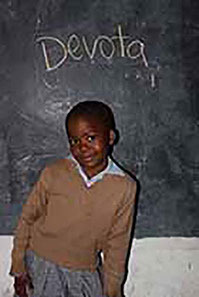 Devotha is 9 years old. 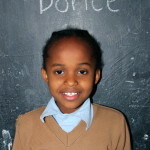 She lives in Sanawari with her Mother, Father, older sister and baby brother. 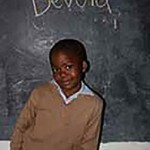 Devotha’s Father works in Arusha city selling tea and coffee and her Mother works as the cook for Charity School. 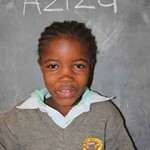 Aziza is 8 years old, she lives in Sanawari with her Mother, older sister and younger sister. Aziza’s Parents separated a long time ago. Her Mother works as a security guard at an apartment building which is the only source of income for the family of 4. Shiness is 9 years old. She lives with her mother and father in Sanawari. Her father is a bodaboda driver his mother does not have a job. Shiness has four siblings, and her brother Fabrigas is in the Baby 2 Class. They are from the Massai tribe and they rent their home. Abduly lvies in Ngarenaro (8km from school) with his mother, older brother and older sister. Abduly’s father passed away when he was very young. Abduly’s mother is quite old and unemployed. His older siblings attend a local government school. 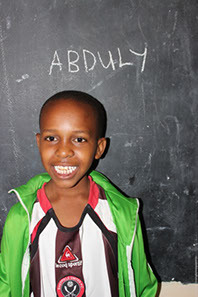 Abduly has been at Charity School since 2010. His family was living in Sanawari but relocated when they could no longer pay rent. 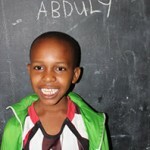 Abduly walks to school everyday because he cannot afford to pay for the local bus. 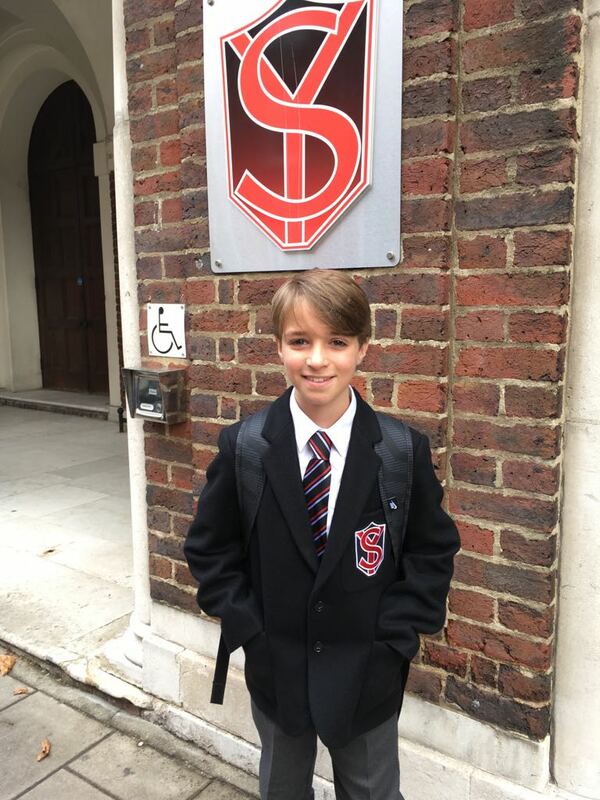 He joined the Charity School in 2015. 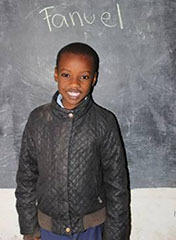 He lives with his mother, father and younger sister Heavenlight (class 3) in a rented house in Sanawari. His mother sells vegetables on the road and his father works in a local shop. They are part of the Chaga tribe. 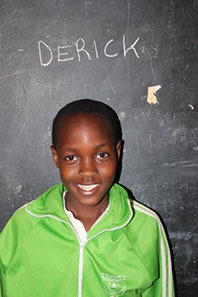 Derrick joined Charity School Arusha in 2015. He had been attending a government school but was kicked out when his parents couldn’t afford the fees. As a result he stayed home for 14 months but joined the Charity School at the request of the local pastor. 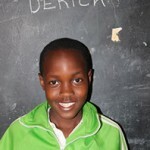 Derrick is a bright boy who has worked hard to be one of the top 5 students in class. Edith is 11 years old. She lives in Sanawari with her mother and father. Edith is an only child, her father works as a watchman and her mother cleans houses. 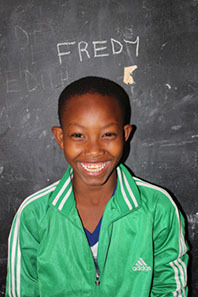 Fredy is 9 years old, he lives in Mianzini which is 5 km from school with his Mother and older brother. 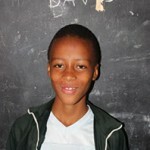 Fredy’s father has remarried and his older brother is in class 6 at a government school. Fredy’s Mother sells food on the side of the road which is the only source of income for the family. 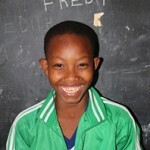 Fredy walks 5km to school every day. 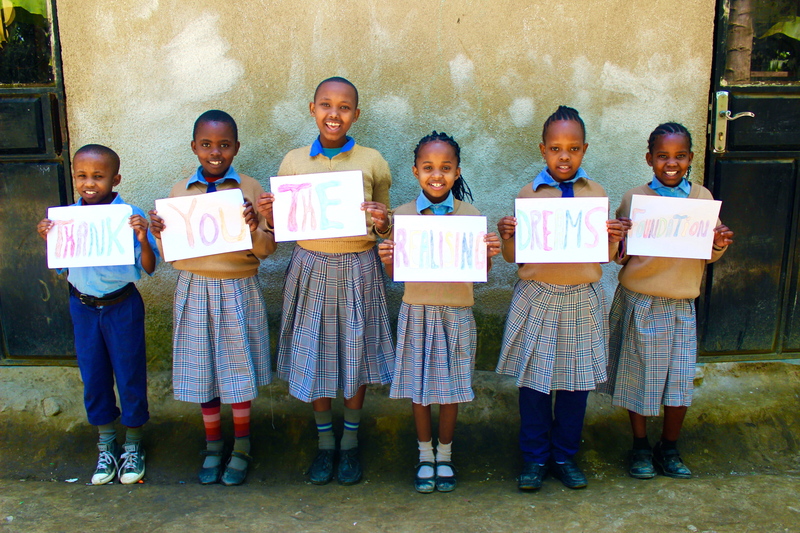 A picture perfect thank you from some of our sponsored pupils from The Charity English Medium School in Tanzania. 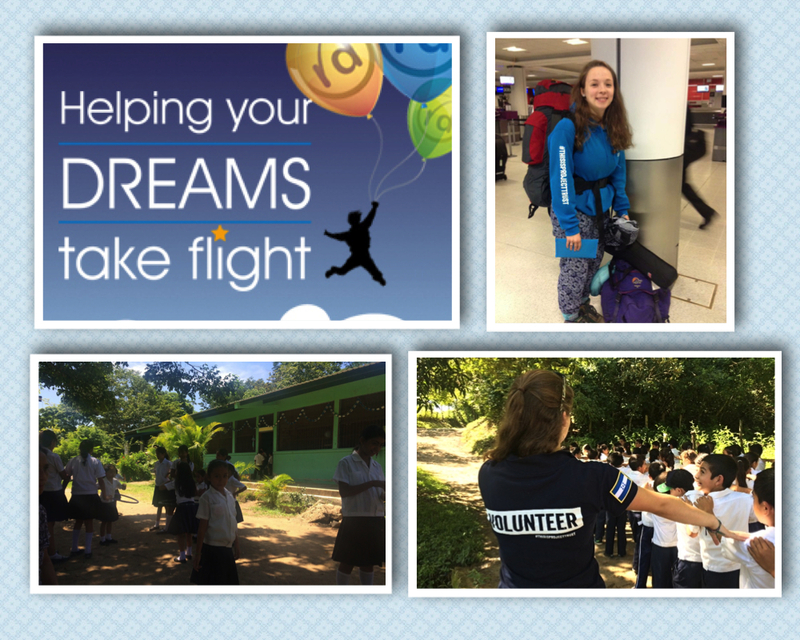 Sara Morrison is a young volunteer English teacher working in Honduras for 12 months. She is an inspiring young person who dreamed of travelling, giving back to others and also teaching English to underprivileged children in a far flung part of the world. As well as teaching English to primary pupils, she has started the school’s first ever choir and is beginning to offer English classes to adults in the area. Sara continues to impress us with her drive and determination to succeed. Instead of presents for her 18th birthday, she asked for donations to charity and then she chose our foundation to receive the funds. 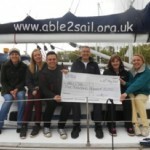 Realising Dreams Foundation Sets Sail with an award to disabled sailing charity able@sail. 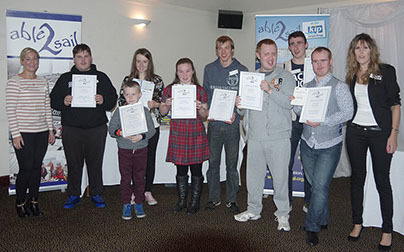 The £5,000 award enabled eight young people through the next level of their sailing training enabling them to become volunteers teaching others how to sail through the able2sail charity. 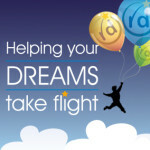 The Realising Dreams Foundation wants to help make your dreams take flight. What do your dreams meant to you? 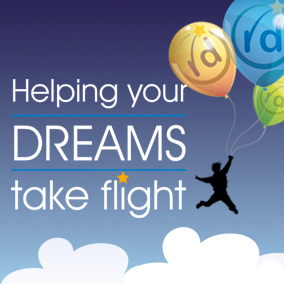 Cycle your way towards your dreams with the help of The Realising Dreams Foundation. 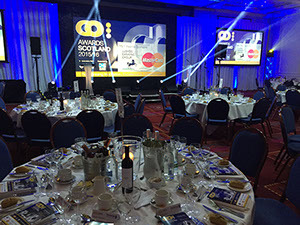 Government Opportunities (GO) Awards Scotland 2015-2016 held at the Marriot Hotel in Glasgow. 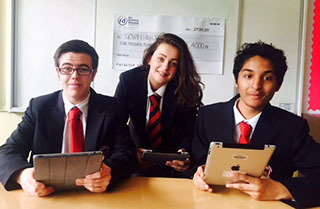 Generous donations raised nearly £2,800 on 6 October 2015 for The Realising Dreams Foundation. 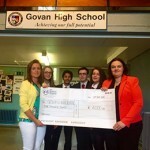 The event raised an amazing £2,800 towards our causes.